RunKeto.com - We are Running on Ketones. This is not a typical story; we are endurance athletes at different stages of our lives, who are experimenting with a low carb Ketogenic diet. We are not doctors or scientists, just athletes. Anthony is the youngest and the fastest, age 20, and prefers ultra road running. Eric (ZoomZoom), age 27, is ukulele playing mixed distance runner. Dan (SKA Runner), age 42, is new to running, prefers mountains ultras, and a bit of a computer geek. Bob(uglyrnrboy), age 54, prefers mountains ultras and loves to tele ski. This site, www.RunKeto.com, will document our journey as endurance athletes implementing a low carb ketogenic diet in to our lives. Please feel free to contact us with any questions you have about our experiences. The ketogenic diet is a high-fat, adequate-protein, low-carbohydrate diet. The diet forces the body to burn fats rather than carbohydrates. Normally, the carbohydrates contained in food are converted into glucose, which is then transported around the body and is particularly important in fuelling brain function. However, if there is very little carbohydrate in the diet, the liver converts fat into fatty acids and ketone bodies. The ketone bodies pass into the brain and replace glucose as an energy source. This elevated level of ketone bodies in the blood is a state known as ketosis. The information on this site is not intended or implied to be a substitute for professional medical advice, diagnosis or treatment. All content, including text, graphics, images and information, contained on or available through this web site is for general information purposes only. RunKeto.com makes no representation and assumes no responsibility for the accuracy of information contained on or available through this web site, and such information is subject to change without notice. You are encouraged to confirm any information obtained from or through this web site with other sources, and review all information regarding any medical condition or treatment with your physician. NEVER DISREGARD PROFESSIONAL MEDICAL ADVICE OR DELAY SEEKING MEDICAL TREATMENT BECAUSE OF SOMETHING YOU HAVE READ ON OR ACCESSED THROUGH THIS WEB SITE. RunKeto.com does not recommend, endorse or make any representation about the efficacy, appropriateness or suitability of any specific tests, products, procedures, treatments, services, opinions, health care providers or other information that may be contained on or available through this web site. RUNKETO.COM IS NOT RESPONSIBLE NOR LIABLE FOR ANY ADVICE, COURSE OF TREATMENT, DIAGNOSIS OR ANY OTHER INFORMATION, SERVICES OR PRODUCTS THAT YOU OBTAIN THROUGH THIS WEB SITE. 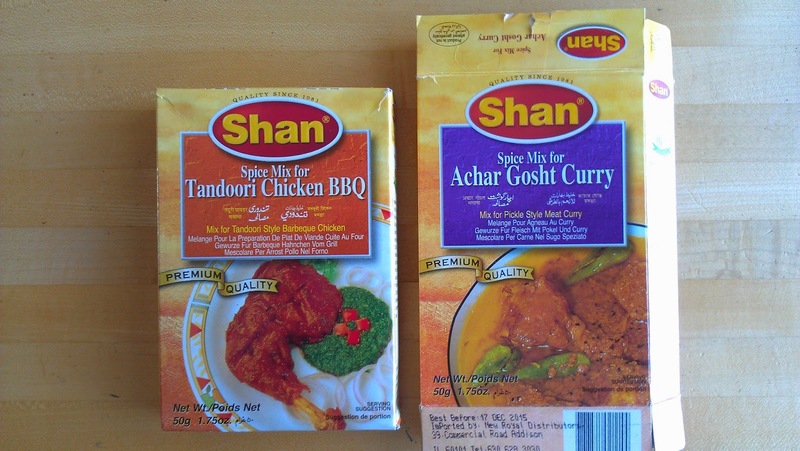 I've been using Shan curry mixes as dry rubs on various meats before grilling. I've used salmon, beef, chicken, and lamb and they all come out amazing. No marinading is required. Below is a picture of my two favorite flavors so far. My most favorite food in the world (at the moment) happens to be home made steak tartare. While it is a good spread for cucumber, celery, radishes, etc. I've found putting it on a piece of Virgil's Green Chille Beef Jerky (1/2 the price at Costco) to be like catnip. ½ cup oil (¼ c Coconut Oil + ¼ c Extra Virgin Olive Oil) an extra 1/2 cup of oil can be used if using very lean meat. Food process the onions, anchovies, garlic, and capers to finely chopped blend. Set aside. Food process egg yolks, vinegar, and 1 tsp mustard for 4 seconds. Then place 4 or 5 drops of oil mixture in. Food process very slowly drizzling in oil to make mayo. If it comes out soupy you can still use it. Blend mayo, the veggies from earlier, ground beef, 1 Tbsp of Dijon Mustard, and spices to taste. I've mostly used ground beef from a cow share that I purchased, but have also used grass fed free range organic 100% USA meat from the store, and venison from this years hunt. While I swim, bike, and run every week I am not a triathlete. What I am is a 27 year old, ukulele playing, keto eating, runner. My pay my bills working as an electrical engineer and I've been eating strictly keto since May 2012. I race every distance from the 1500 meter to the 50 mile but I'm only competitive at trail races and ultras. I started running in 2004 to lose weight and hated it. By the time I could run 3 miles I decided that I loved running. Since 2009 I've lost 47 lbs and kept it off. I was an average high school runner who skipped my last two track seasons to coach myself. Even then I had a strong interest in going far. I wanted to race to find out how hard I could push my body. I wanted to go further than anyone, even then. My senior year I met a guy who seemed to be what I wanted to become. It turns out he was. The guy’s name was Zach Gingerich, a soon-to-be Badwater 135 champion, and a person who seemed so full of passion that anyone would want to get in on what he had. A year later he invited me to join him at the Huff 50k in Indiana, a 33 mile trail race in the middle of winter. After starting off conservatively, I fell apart somewhere in the middle. My road racing had taught me that aid stations are for slow people, not me. I didn’t drink on any of my training runs, why would I drink and eat now? It turns out that’s not the best plan for running ultras. It was the worst racing experience that I’d ever had, but as I sat in the snow at the finish I contemplated my next ultra and how much better I could be. Like any ultrarunner hasn’t heard this story before?! It’s been over two years since Huff and I’ve moved from surviving 50k’s to being comfortable pushing hard the entire time. And I’ve been able to win a few races beyond marathon distance and even set a course record or two. With a couple 50 milers behind me and a few 100’s to come this summer, and with the addition of a ketogenic diet, I’m ready to move up in distance and prove myself as one of the best ultrarunners in the US. Everyone wants to know what I eat every day for my Ketogenic Diet. Well, I just made it public on MyFitnessPal.com, so I am all out there . . .
Disclaimer: I do not have the best eating practices, but I am working on it. I try to eat fruit and veggies every day, while keeping my carbs under 50 grams a day. And of course a lot of FAT! Sometimes, I am embarrassed of what I eat, so by making it public might help me be better. Also, I have been implementing intermittent fasting (IF), so some days might not seem like I ate anything, but it was on purpose. Please feel free to email me with suggestions. Running is one of the passions in my life and I have been running for as long as I can remember. In junior high I ran on the school track team and in senior high I ran on the cross-country team. After graduation I started running non-competitively in a variety of road races; 5K, 10K, and ½ marathons. In 1995 I ran my first marathon and have been hooked ever since. My second marathon in 1996 was with the Team-In-Training marathon training and fund raising group supporting the Leukemia Society of America. This was one of my most memorable marathons because of the great experience of being part of a training team and raising money for a worthy cause. I have run a total of 21 marathons, with four of these as a member of the Team-In-Training group. I was a coaching mentor for a group of 10 runners for three of the Team-In-Training marathons. In 2007 I was the coach for the Denver contingent of the World Vision Chicago Marathon team. In 2009, I was the marathon coach for the inaugural Second Wind Fund marathon training team and I continued coaching for the 2010 Second Wind Fund marathon training team in 2010. These mentoring and coaching opportunities allowed me to share my passion for running with others. I am a certified running coach by the Road Runners Club of America. In the summer of 2012 I started running ultra events and have completed two 50 mile runs and 78 miles of the Big Horn 100. Mountain ultras are the best ever...combining two of my passions...spending time in the mountains and running! Tele skiing is my third passion which is also in the mountains – perfect. Trail Running and the Weekend!